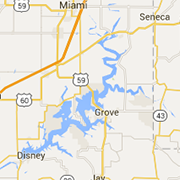 Looking for things to do in Grand Lake, OK? You're in luck! Grand Lake offers something for everyone, whether you want to have an outdoor adventure, enjoy watersports, take in a show, play the night away at the casino, or have a fun-filled afternoon with family. Check out all these Grand Lake entertainment venues and activities. Located on the grounds of Picture in Scripture Amphitheater, Oasis Animal Adventures is an animal therapy program using exotic animals as a gateway to the heart. Today's Hours: Click on hours above.